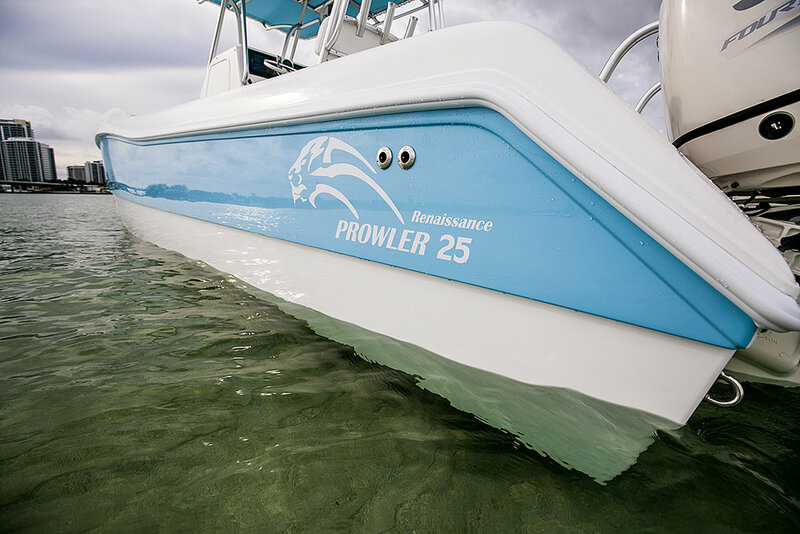 Prowler 25: big-boat ride and capabilities in a trailerable package. 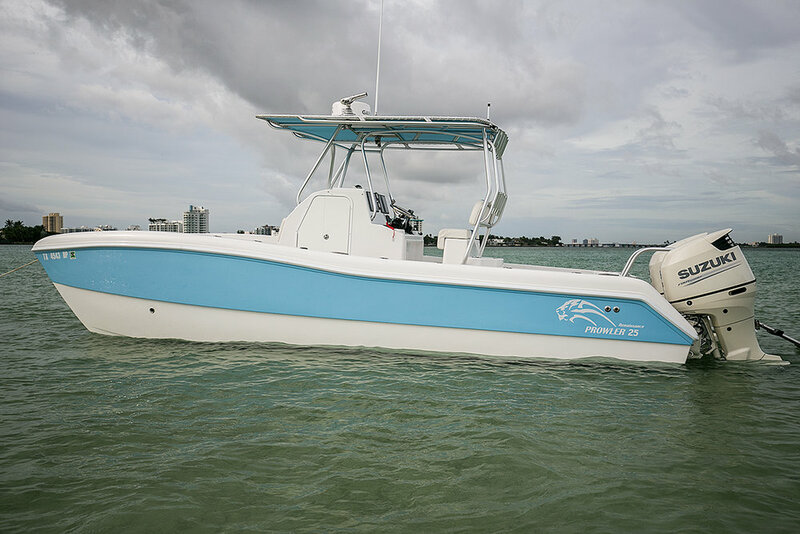 Quite possibly the biggest 25-foot center console built today, the Prowler 25 boasts more than 1,500 quarts worth of belowdecks storage, an expansive console with room for a pair of 12" displays plus a full-size head inside, 170 gallons of fuel for long runs to the stream or islands, and a cockpit capable of doubling as a small dance floor. But that doesn't slow her down. Weighing in at only 2,700 lbs. unrigged, the 25 is incredibly efficient. With just 180 hp, she'll touch 40 mph at WOT while sipping fuel. With twin 150s, she can cruise at better than 3 mpg. With the maximum rated 400 hp, she reaches well into the 50s yet still offers excellent cruising economy. 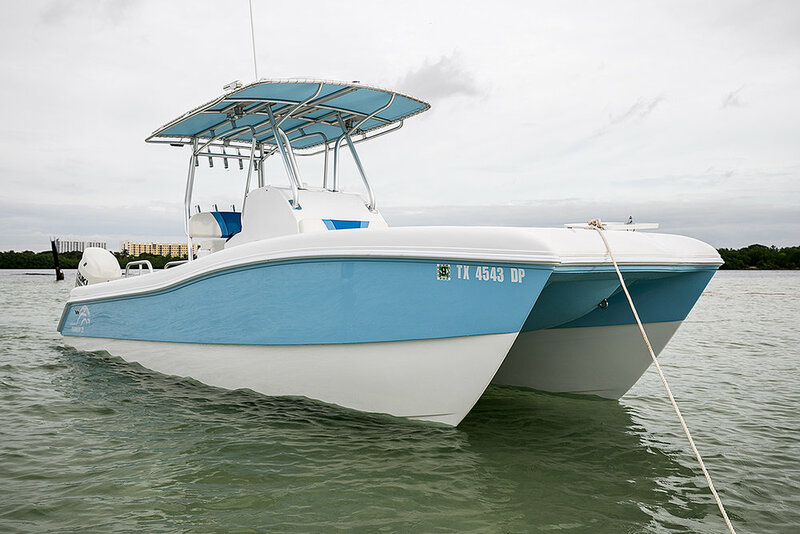 Her light weight also translates to an 11-inch hull draft that's competitive with most bay boats. 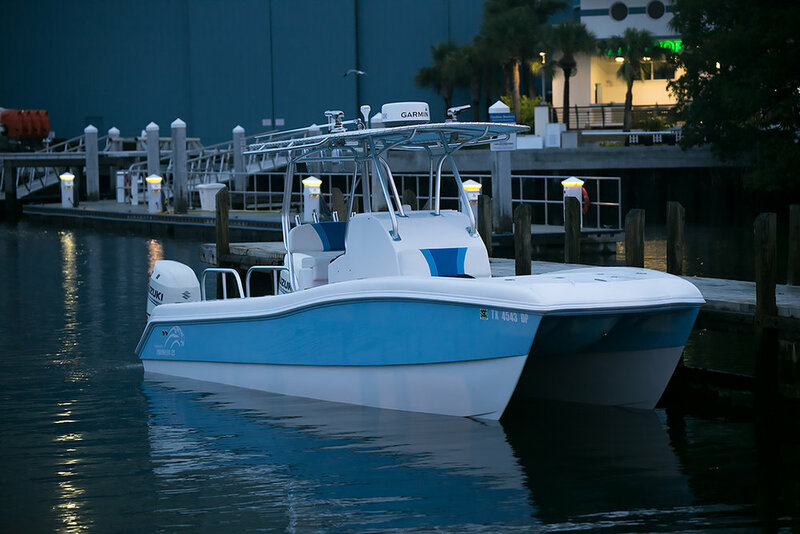 Three-piece construction yields not only more usable deck space and better fishability than the two-piece construction employed by production cat builders but also greater strength and rigidity. Meanwhile sharp entries, a high tunnel, and patented running surfaces make for a ride that will make even the most dedicated monohull partisan think twice. Like all our boats, the 25 is designed by a lifelong waterman with maximum utility in mind. That means an oversized console with comfortable seating, everything in the right place, and a big side-entry door. It means wide-open access to all plumbing and wiring. It means a 45-gallon live well in the leaning post where it's most accessible. And it means our signature walk-through transom and dive platform. Hull weight dry: ~ 2,700 lbs. Just how efficient is the Prowler 25? At 26'2" long x 8'9" wide, she'll plane off with just a single 90 hp engine. That's thanks to advanced materials and techniques and carefully engineered running surfaces, which also yield exceptional performance. 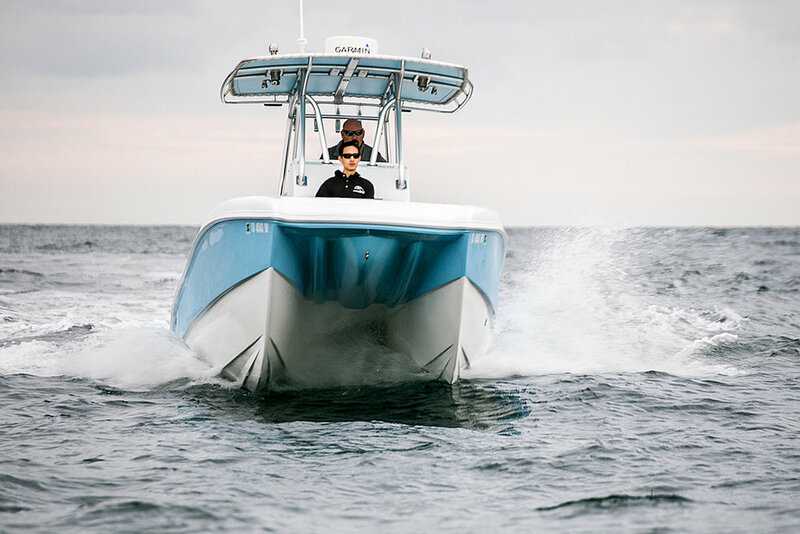 With twin 150s, the 25 tops out in well in excess of 40 mph and cruises at better than 3 mpg. 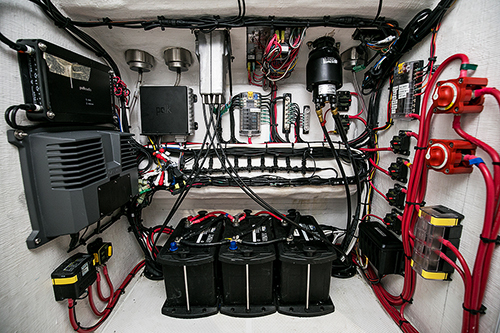 The under-26-foot catamaran class is dominated by mass-produced boats from big-name companies. All have their strengths, but none employ the Prowler 25's three-piece construction. 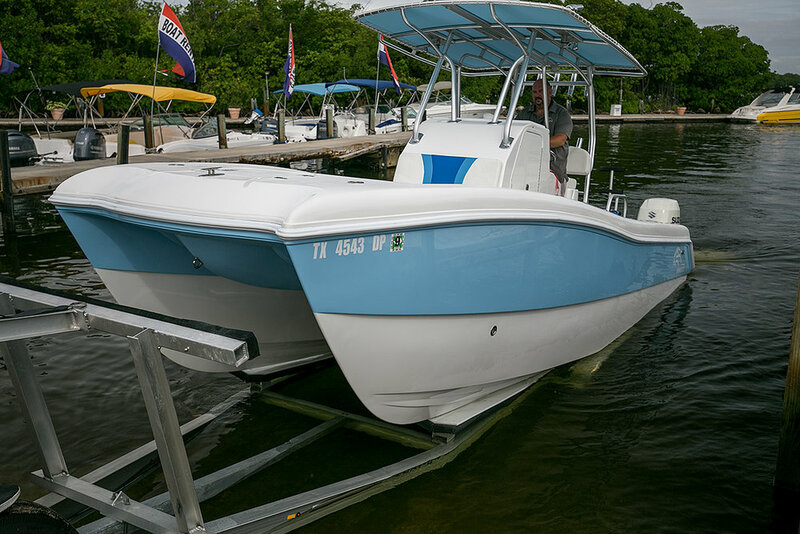 Three-piece boats offer more usable interior volume, space under the gunwales to plant feet securely, and greater structural integrity. With a 325-qt. 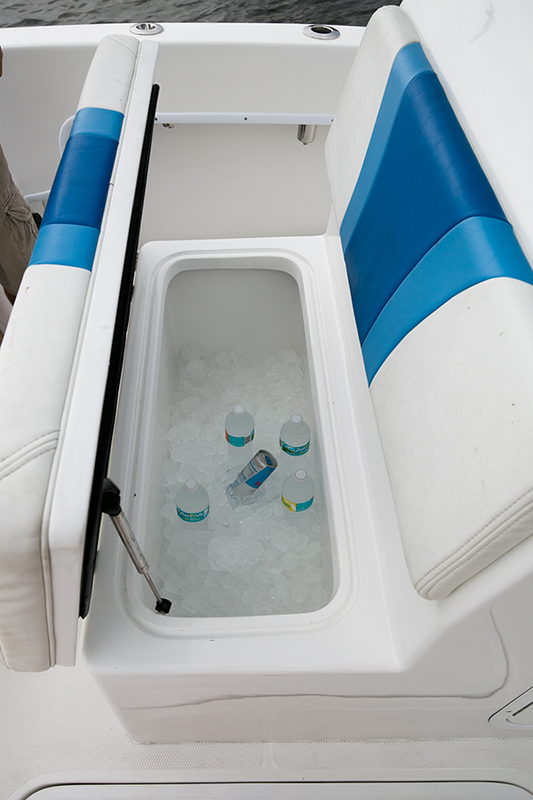 insulated, overboard-draining compartment under the casting deck; twin 180-qt. 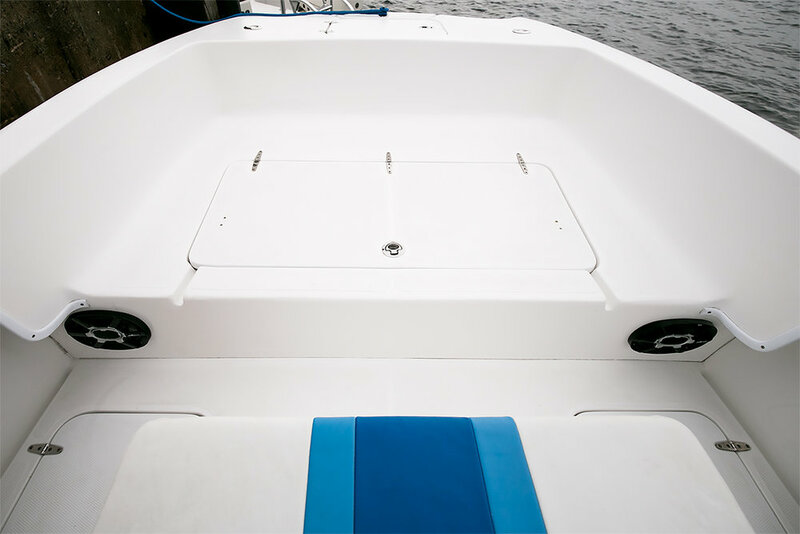 storage lockers forward of the console, each with racks for four offshore rods; and twin 430-qt. 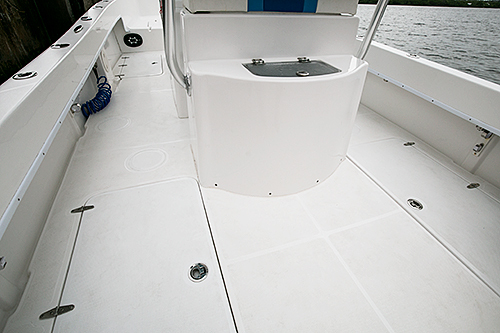 insulated fish lockers aft, it's easy to keep the Prowler 25's expansive decks clear. 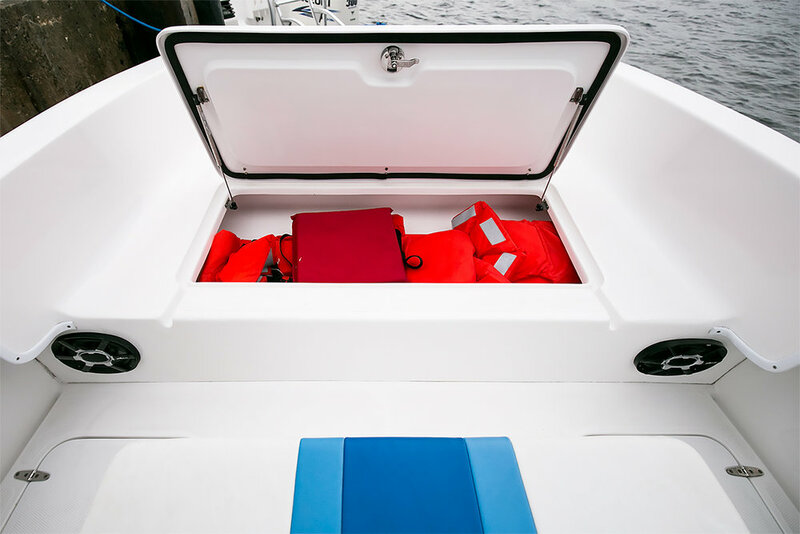 Even the console is spacious, with a side-entry door and room for a full-size marine head. At Prowler, form follows function; fishing and diving come first. The 25 features a 45-gallon lighted livewell in the leaning post, deep toe-kicks under the gunwales for security and power when fighting fish, cavernous insulated storage, plenty of room for today's multiple large electronics displays, a massive anchor locker for long rodes, and easy entry and exit via a walk-through transom leading to a large center dive platform. 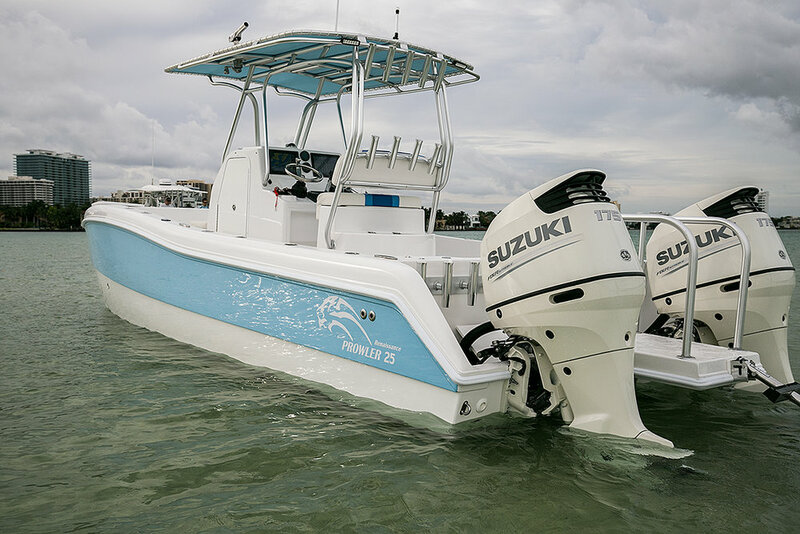 Despite her smaller size, the Prowler 25 is no toy boat. She's fitted with all through-bolted Type 316 stainless steel hardware including 6-inch popup cleats. Twin 2,000 gph Rule pumps keep the bilges dry. 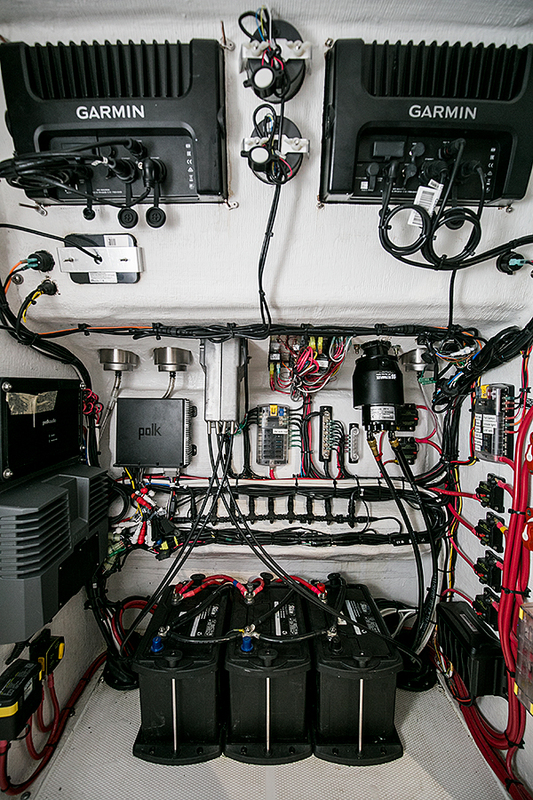 A custom breaker panel with indicator lights and meticulous color-coded wiring make trouble-shooting easy, while top-quality components, tinned wiring, and epoxy-lined connectors mean it's rarely necessary.